This volume, a collection of eleven original essays by many of the foremost U.S. military historians, focuses on the transition of the Army from parade ground to battleground in each of nine wars the United States has fought. Through careful analysis of organization, training, and tactical doctrine, each essay seeks to explain the strengths and weaknesses evidenced by the outcome of the first significant engagement or campaign of the war. 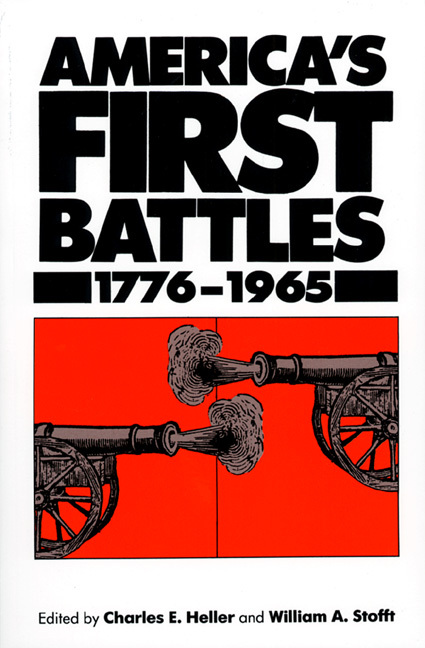 The concluding essay sets out to synthesize the findings and to discover whether or not American first battles manifest a characteristic "rhythm." America's First Battles provides a novel and intellectually challenging view of how America has prepared for war and how operations and tactics have changed over time. The thrust of the book—the emphasis on operational history—is at the forefront of scholarly activity in military history. Lieutenant Colonel Charles E. Heller is Chief of Mobilization Requirements, Operations, and Training oat the Army Reserve Personnel Center. Brigadier General William A. Stofft is the Chief of Military History for the U.S. Army.